124 min. TriStar Pictures. Directors: Kenneth Branagh, Andrew Marcus, Simon Crane. Cast: Robert De Niro, Kenneth Branagh, Tom Hulce, Helena Bonham Carter, Aidan Quinn. 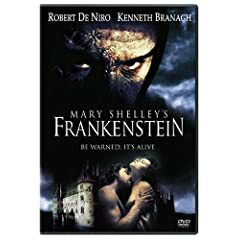 As a companion piece to his Bram Stoker's Dracula, Francis Ford Coppola commissioned (as producer) Mary Shelley's Frankenstein and offered the helm to actor-director Kenneth Branagh. By making somewhat of a Wellesian splash on stage and film, Branagh had gained popularity as the premiere film interpreter of Shakespeare in the late eighties and early nineties. In addition to films of Henry V and Much Ado About Nothing, Branagh had, by 1994, put out an ambitious, gregarious neo-noir called Dead Again, and so the thought of the director tackling a classic thriller made sense. And though Branagh's film of Mary Shelley's Frankenstein was met with hostility, its over-the-top Gothic grandeur was a bold and not entirely unsuccessful attempt to revivify Shelley's original tale. Branagh's is the rare film version of Shelley's 1818 novel to preserve most of its shape and content. Opening with a Shelley quotation about the story's attempt to tap into "the mysterious fears of our nature," Branagh's version moves on to the novel's framing device involving Captain Robert Walton (Aidan Quinn), an obsessive explorer "the dawn of the Nineteenth Century" who risks the lives of his crew during an expedition to the North Pole. Ice-bound, Walton encounters Dr. Victor Frankenstein (an occasionally overripe Branagh), who asks Walton, "Do you share my madness?" Frankenstein means the obsessive pursuit of greatness and fame, a theme developed in the cautionary tale he tells Walton about hubris and an uncontained "lust for knowledge." Traumatized by the perceived injustice for death, young Frankenstein resolves to unlock the secrets of life so that he can bring back lost loved ones. The ultimate story of man playing God, the Father, Frankenstein details the unholy experiment that results in the creation of "The Creature" (Robert De Niro, intense and effective). Branagh wisely preserves the post-Shelley tradition of having Frankenstein create his creature from spare human parts stitched together and shot through with electricity; Shelley's vague description of the monster's creation wouldn't do on film, and the rooting in pseudo-science underlines the story's critique of humanity's unchecked technological advance during the Industrial Revolution. The screenplay by Steph Lady and Frank Darabont (The Shawshank Redemption) outlines Frankenstein's familial upbringing in Geneva (with Papa Frankenstein played by Ian Holm), and his formative years spent alongside the love of his life, Elizabeth (well played by Helena Bonham Carter). Frankenstein trundles off to the University of Ingolstadt med school (motto: "Knowledge is power only through God"), where the great Robert Hardy and John Cleese vie for Victor's soul, at least where it concerns medical morality and ethics. It is here, too, that Victor befriends the loyal Henry Clerval (Tom Hulce). Tragedy, scientific fervor, and self-aggrandizing drive lead Victor to piece together the Creature, whose spare parts derive from a great mind and an crazed homicidal malcontent (also De Niro). Truly the sum of his parts, The Creature has a poetic soul yearning to understand its existence—what he is and why he was created—but also a volatile killer instinct. "You gave me these emotions. But you didn't tell me how to use them," he tells Frankenstein. "Who am I?" As in the novel, The Creature studies a human family and, despite the generosity of spirit of a blind man (Richard Briers), quickly becomes an object of scorn and abuse. Recognizing that Victor has doomed him to an accursed life in the shadows, The Creature demands but one thing of his creator: a bride. In following this train of thought beyond the source novel, the film compounds the tragedy by extrapolating the consequences of "father" and "son"'s shared desire for a lifelong mate. Branagh's ambitious take succeeds as a cautionary tale about true monstrosity: hubris and man's inhumanity to man. But one man's operatic style is another man's unintentionally comical excess, and Mary Shelley's Frankenstein certainly tempts fate with its dizzying camerawork (the cinematography's by Roger Pratt, who shot Brazil), heart-pounding energy (a tip of the hat to composer Patrick Doyle), and theatrical, grand-scale sets (thank production designer Tim Harvey) and costumes (James Acheson). Still, if the worst one can say about the film is that it tries too hard, that ain't so bad. 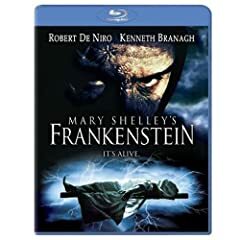 After all, it is, arguably, the preminent Gothic horror story, and Branagh and company are smart enough to squeeze out every bit of its sticky, enduring relevance (literally sticky in the case of the amniotic fluid Frankenstein uses as a birthing solution). Truly it can be said of Branagh's version, "It's alive. It's alive!" Sony does a nice job in porting Mary Shelley's Frankenstein over to Blu-Ray hi-def. Looking much sturdier than its DVD equivalent, this transfer is steady and accurately recreates the film's theatrical appearance, from the muted color to the light film grain. The film never looked razor sharp, and doesn't now, but the picture is still quite good in picking up what detail there is in the source; black level and contrast are solid. Audio comes in the form of a DTS-HD Master Audio 5.1 mix that renders the elements in a nice balance, with clear dialogue and reasonably robust music and effects. Unfortunately, though the movie would benefit significantly from contextualizing bonus features, the disc offers nothing but BD-Live accessibility and a smattering of unrelated trailers. Still, fans of this film (and I count myself among them) will relish the opportunity for a significant A/V upgrade. All site content © 2000-2019 Peter Canavese. Page generated at 04/19/2019 09:08:31AM.